A strong negative correlation between the percentage of intermittent generation on the grid and the price received by solar and wind generators was established from German electricity data for the year 2013. This negative correlation will increasingly hamper the competitiveness of intermittent solar and wind which are expected to be the primary drivers of the Energiewende from this point forward. Solar and wind advocates often point to the falling electricity prices in Germany as a sign that the Energiewende is working and intermittent renewables are not as expensive and impractical as critics claim. However, as this article will strive to demonstrate, quite the opposite is true. Falling electricity prices offer a good demonstration of how quickly the market discounts intermittent renewables as penetration increases, thereby further eroding the already poor competitiveness of these electricity sources. As discussed previously, intermittent renewables enjoying priority dispatch regularly reduce demand for dispatchable generation, thereby reducing prices. This simple supply/demand mechanism creates a situation where owners of intermittent renewable generators are forced to sell the bulk of their product at times when prices are the lowest, thereby requiring subsidies even after grid parity is reached on a LCOE basis. In addition, the inevitable oversupply created by technology-forcing of intermittent renewables puts further downward pressure on prices. Thanks to electricity data published by the Fraunhofer Institute, this market theory can be validated using detailed data of electricity generation by intermittent renewables (wind and solar) and spot prices. The analysis will first focus on weekly data and then enhance this data through information gained from more detailed hourly data. As seen in the figure, the weekly solar and wind generation explained about 45% of the variance in the weekly German spot price (as indicated by the R2 value) with higher solar and wind generation leading to lower spot prices. 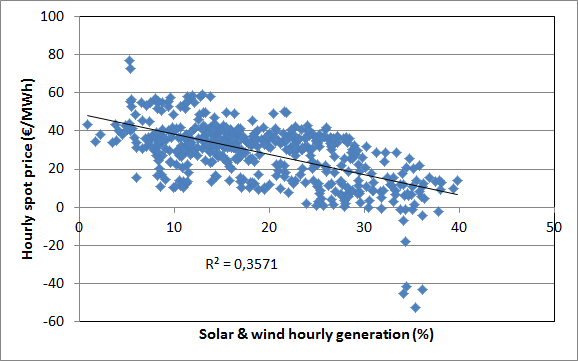 To better visualize the effect of intermittent renewables on the electricity grid, the amount of intermittent renewable generation can be expressed as a percentage of total generation, i.e. the degree by which the system is changed from the standard fleet of dispatchable generators. This correlation is shown below. Note that the total weekly electricity generation data from Fraunhofer used to express intermittent renewables generation as a percentage of total generation was augmented by 28%. This was done based on the difference between total German electricity generation in 2012 as given by BP (618 TWh) and that given by Fraunhofer (483 TWh) because Fraunhofer only reports traditional generation from sources greater than 100 MW (biomass is totally neglected for example). 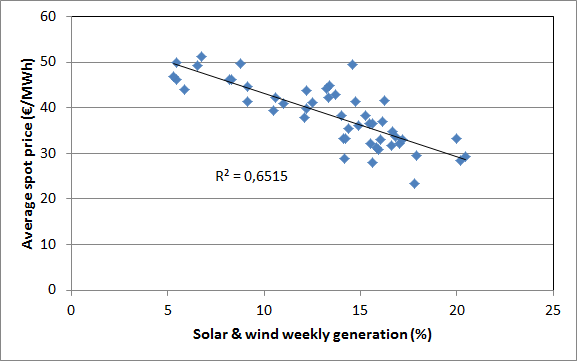 It can be seen that the correlation is now stronger, with the percentage of intermittent renewables present in each week explaining fully 65% of the variance in the data. However, two additional adjustments are necessary to better reflect the electricity price implications of higher penetrations of intermittent renewables. Firstly, it should be acknowledged that Germany uses its neighbours’ dispatchable generation capacity to balance out a significant portion of the intermittent capacity on its grid. This implies that the percentage of intermittent renewables on the German grid should rather be seen as a smaller percentage of intermittent renewables on the grid of Germany and its closest neighbours. Secondly, it must be acknowledged that the average weekly price received by intermittent renewables will most likely be lower than the total average weekly price due to hourly price fluctuations in response to intermittent spikes during the week. These two factors were assessed by analysing hourly data on total electricity generation, intermittent generation, export/import fluctuations and spot prices. An inverse correlation between intermittent renewable generation and prices as well as a correlation between intermittent renewable generation and exports can be qualitatively discerned from the figure. These effects are quantitatively analysed below. The correlation between hourly renewable generation and imports/exports for all hours in the three aforementioned weeks is shown below. It is immediately clear that the correlation is substantially weaker than the correlations shown in previous plots. However, despite only explaining 11% of the variance in the data, the correlation is still very highly significant with a very low p-value of 1.2E-14 because of the large sample size (generally a p-value below 0.01 can be considered to be highly significant). The correlation in the above data is relatively weak primarily because the three weeks in question were wind-dominated weeks. High capacity factor wind (such as Germany experiences during winter months) is a fairly good quality resource which, at relatively low penetrations, does not require rapid ramping of balancing power plants. For solar dominated weeks, such as week 25 shown below, the situation is quite different. It is immediately clear that Germany uses a lot of the dispatchable capacity of its neighbours to help balance sharp daily fluctuations in solar output. 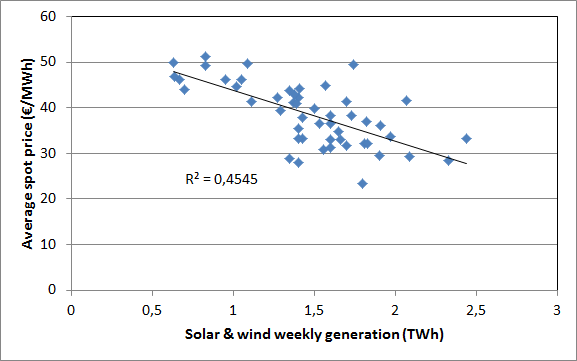 The correlation between intermittent renewables output and the import/export balance is given below where it is confirmed that intermittent generation explains a much larger portion of the variance in electricity exports in the solar-dominated week than in wind-dominated weeks. 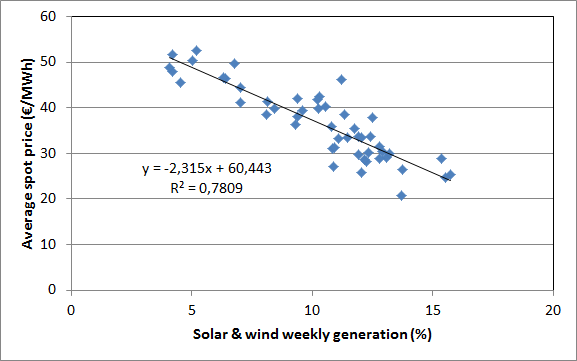 In conclusion, it can be gathered from the previous two figures that, for every 1% increase in generation from intermittent renewables, German electricity exports increase roughly by 0.28% in wind-dominated weeks and 0.46% in solar dominated weeks (derived from the slopes of the linear regression fits). It can therefore be conservatively estimated that Germany uses an additional 30% of dispatchable generation from its neighbours to balance out its fleet of intermittent renewable energy generators (i.e. if solar and wind ramp up by 1%, exports ramp up by 0.3%). 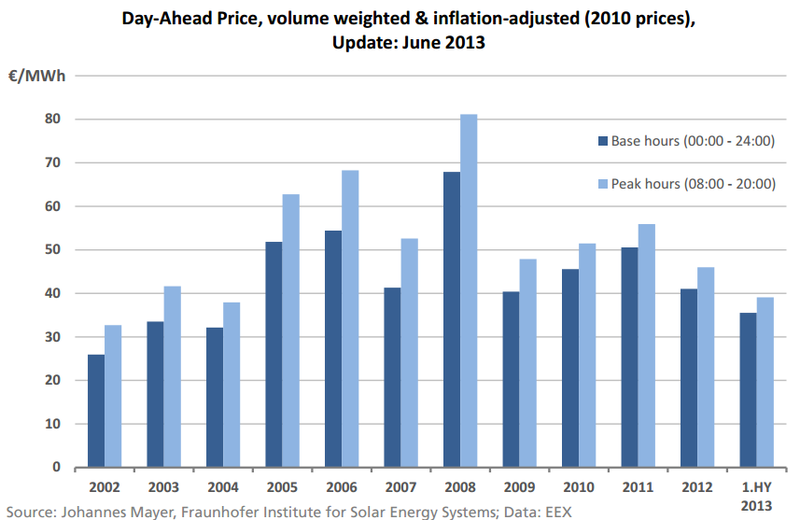 The trend is again easily discernible and clearly illustrates that wind and solar operators must sell the bulk of their product at low prices. The volume weighted average spot price received by solar and wind operators in these three weeks was calculated to be 13.1% lower than the volume weighted average spot price for all generation. It can therefore be concluded that, for a week where solar and wind contribute about 20% of total electricity, wind/solar operators will receive 13.1% lower prices per kWh generated than the total average. In conclusion, it can be estimated that solar and wind operators will receive a premium of 10% at ~0% penetration, but will have to give a discount of 13% at 20% penetration. It is assumed that this premium/discount varies linearly between these two datapoints. The percentage of intermittent renewables is divided by a factor of 1.3 to account for the estimation that Germany uses the dispatchable generation of its neighbours to balance out 30% of the variation in its intermittent renewables. The price received by solar and wind operators will be 10% above spot at ~0% penetration and 13% below spot at 20%/1.3=15.4% penetration. It can be seen that the weekly solar and wind generation percentage explains fully 78% of the variance in price received by solar and wind producers. 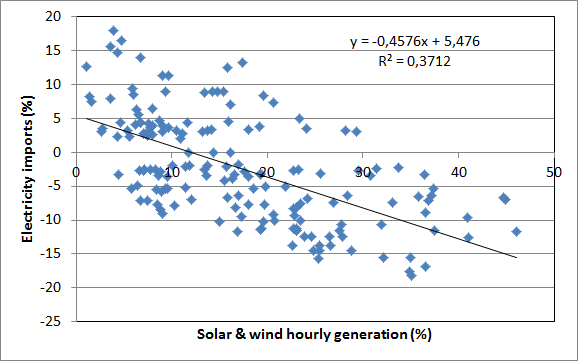 The regression shows that, for every percentage increase in intermittent generation, solar and wind operators will receive €2.3/MWh less for their product. This implies that, under current market conditions, intermittent renewable energy will be valued at €0/MWh when it reaches an estimated 28.3% penetration in a given week. 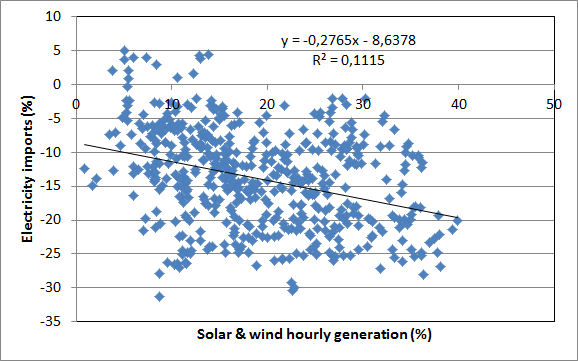 This article has demonstrated a strong negative correlation between the percentage of intermittent renewable energy generation (solar & wind) and the price received by generators of this intermittent power. Through this mechanism, the economic attractiveness of intermittent renewables will rapidly deteriorate as more subsidized capacity is brought online. This understanding is very important because, as can be seen from the graph below, the Energiewende is projected to be driven almost entirely by intermittent wind and solar from this point forward. Generation from these intermittent sources is projected to increase from 2013 values for solar and wind of 29.7 TWh and 47.2 TWh respectively (more than 15% behind the 2013 targets outlined below) to the 2018 targets of 48.3 TWh and 104.1 TWh. The easy days of expansion through reasonably practical and affordable biomass and low-penetration onshore wind are a thing of the past. From this point onwards, the Energiewende will have to be driven by installing ever-increasing amounts of solar PV and offshore wind at optimistic costs of around €130/MWh in a market that will offer prices dipping further and further below the current $37/MWh for increasing quantities of this intermittent electricity. It is therefore quite clear that the situation in Germany is highly unsustainable at present. Just how and when this story will end remains anybody’s guess though. Probably the only thing that is for sure is that the world will continue watching with great interest. The data in this article is from the Fraunhofer Institute and can be found by clicking here. While I completely agree on the intuitive merits of storage increasing demand during times of oversupply and increasing supply during times of undersupply, I have my doubts about the large scale deployability. Most obvious is the cost which still needs to drop manyfold to reach the point of large-scale unsubsidized deployability (probably energy storage for a maximum cost of $40/MWh). This low storage cost can be achieved by a theoretical battery that costs about $40/kWh fully installed, achieves 50% charge/discharge every day over a10 year life with no degradation, has no O&M costs and buys electricity for $0/MWh (implying no cost associated with the ~20% exergy loss in battery storage). I don’t know if this is possible. Aside from the unlikely target of $40/kWh of fully installed battery capacity, I see real issues with actually achieving 50% charge/discharge every day in a real-world electricity market. When balancing solar PV in very sunny areas, this might be possible, but for the majority of the world where solar power is highly seasonal and most intermittent electricity will come from wind which might blow for one week and then die down for another week, batteries will probably be lucky to average one profitable charge/discharge cycle per week. 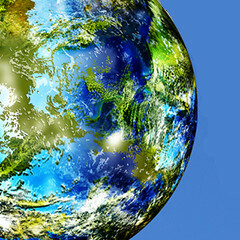 This real-world effect will greatly detract from their already doubtful economic feasibility. Regarding power-to-gas, ITM has recently greatly reduced its projected hydrogen generation costs from electrolysis to only $6.50/kg (equivalent to natural gas at $57/MMBTU). For comparison, US natural gas costs $4.20/MMBTU and European natural gas about $11.5/MMBTU. It therefore also still has a very long way to go. ITM also used a rather low electricity price of $50/MWh and a high plant utilization factor of 70% in their calculation. This assumes that the plant gets a near-continuous supply of electricity at wholesale prices without paying any T&D costs or taxes. Obviously, these expensive storage solutions can be deployed under subsidies like solar and wind, but it appears as if Germany is close to the point where further increases in the energy subsidies will be politically impossible. The Germans are unique in their willingness to pay for perceived environmental protection, but even this has limits. Forcing the deployment of storage in parallel to the expensive solar PV and offshore wind that must drive the Energiewende from this point onwards appears pretty much impossible. Yep, intermittent renewables in Germany are helping to lock in decades of emissions from new coal-fired plants. Despite their great ideological attractiveness, intermittent renewables remain the most expensive and least practical mechanism for large scale CO2 abatement. 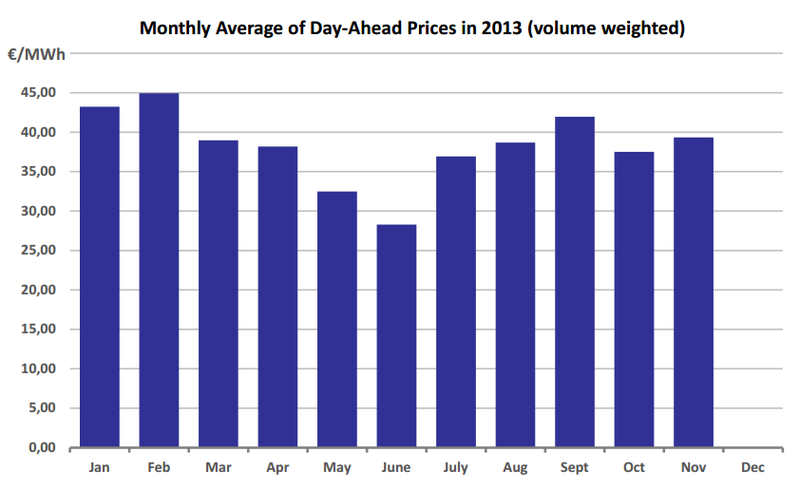 Can you expand a bit more on why “the spot-price-lowering by wind energy” is a red herring? From my understanding must-take wind and solar power reduce demand for dispatcable generation, thereby reducing power prices. Sure, there are many mechanims by which electricity is traded, but in the end, it all comes down to supply and demand. If intermittent renewables decrease demand for a fixed supply of dispatchable generation, prices will decline. If the resulting reduced demand goes below the supply of baseload plants, negative prices result because ramping down a baseload plant to compensate for an hour or two of intermittent wind is not feasible. There is no doubt that must-take policies for wind and solar adversely affect traditional generators, primarily through this reduction in spot prices. It is quite possible that Germany will soon have to start subsidizing its struggling utilities in order to keep the Energiewende going (through a capacity payment system). While storage seems intuitively to be a good fit, that hasn’t been the case in reality. Der Spiegel can be a bit of a lightning rod as a source, but the claims in the article were analyzed by P.F. Bach in The German Pumped Storage Paradox, which concluded, as I understand it, that pumped storage will not be economical in Germany without an economic model that pays for firm capacity. A good post on an important topic. Although I believe that this analysis doesn’t so much show that high penetration renewables are impractical, merely that the deregulated hourly-bid market structure is ill-suited for them. This should come as no surprise, since this market design was optimized to dispatch fossil fuel fired generation. My (regulated) local utility mostly just pays the wind farms a fixed rate for 100% of their output for twenty years (Power Purchase Agreements), then uses their own fossil fuel fired plants to generate most of the rest (we are also part of a regional grid with a large balancing area). About 80% of the cost of wind power is the capital cost, so these 20 year contracts make a lot of sense. For long-lived plants like nuclear (and perhaps solar), I think it makes more sense for a regulated utility to own the plant, so that the low future cost of power is passes on to the end-users. Of course the real sticking point of the German system is that the feed-in tariffs are unsustainably high. Rooftop solar still pays US $ 0.186/kWh and utility scale is US $0.129/kWh. Still way too high given that it does not include smoothing via storage or thermal backup capacity payments. Well, I believe the reduced prices offered by the market for intermittent renewables is a very good indication of the reduction in the value of intermittent wind and solar as penetration increases. There is actually some good literature out there that illustrates how increasing solar/wind penetration reduces the value per kWh (this presentation gives a good summary). This will be a topic of future posts. The fixed PPA arrangement is certainly the best way to guarantee return on investment for wind and solar operators and ensure deployment, but it is not the best way to minimize the full system LCOE. If solar and wind operators had to take into account the reduction in the value of their product as more solar and wind capacity is brought online, investment decisions would be very different. One thing is certain: Germany will not remain an industrial nation if it succeeds in making it on so-called “renewables”. Already, more than 50% of Germans agree that the costs of the Energiewende need to be distributed more equally across all electricity users. This means that the exemptions from paying energiewende-taxes for industry will come to an end. When it does, German industry would not invest anymore in German and it will therefore be shut-down and offshored. This process has already started. Concerning the outlook for large-scale storage scaling up in Germany, I think this will not happen. 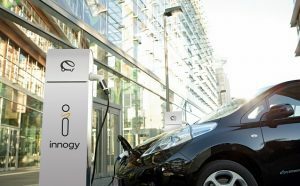 Investors in such technology are dependent on the current peculiar energy policy in Germany remaining unchanged for the next few decades in order to maintain the current market failure that is causing the negative spot prices. That is not a bankable proposition (assuming German’s recognise the unsustainability of their energy policy) so private investment in large-scale storage of energy in Germany will never materialise, IMO. The risk of German energy policy being rationalised before 20 years pass is too great, IMO. My outlook for Germany is that the Energiewende will fail sooner or later. It really depends on the amount of sacrifice German people are willing to bear. If they are very good at sacrifice, the Energiewende will go on for longer. But if they are not good at it, then the Energiewende will fail sooner. The current version of the Energiewende which puts all the costs solely on the households will eventually lead to a per kWh cost of electricity of up to €ct 100 per kWh for households. At that point, 100% of electricity in Germany will be sourced from renewables or CCS with an average all-in cost of €ct 25 per kWh, but because industry will not pay for these costs, the per kWh price for housholds will be up to €ct 100 per kWh. Will German households enjoy paying these costs? I don’t think so. The German working class will not accept it, in my estimation. When the Energiewende fails, it will fail big-time. Within one or two decades from the failure, all the then installed renewable energy systems will be depreciated and scrapped, returning the German electricity system to the concept employed in the middle of the previous century, namely it will return to complete fossil fuel dependence, mainly brown coal. It would be the laughing stock of Europe! However, none of this is likely to happen. I expect the Energiewende to fail more gracefully and quickly, before the hole gets really deep, and I expect Germany will then turn to nuclear power again as the only realistic option. After that it will take another 15 or 20 years to bring German electricity to 80% nuclear. IMO the real question is who will build those new nukes. France? Asia? Russia? Or perhaps Germans will re-build their own nuke industry? Ok, I agree with what you are saying. There is no way that an alternative market design will fix this decline in value of energy from variable renewables. Continued government incentives/policy support can force renewable use, but as you say, the economics will decline (not improve as claimed by proponents). Of course it is really the availability of low value (and low cost) energy that makes energy storage and fuel synthesis economically possible. So they can’t solve the problem either. Unfortunately, California does not seem to publicise its energy data in such detail as Germany, so it is not possible to arrive at any quantitative conclusions. I can make a few qualitative observations from an overall system LCOE though. In general, the impact of intermittent renewables, especially solar PV, should be substantially less severe in California than it is in Germany. Unlike Germany, solar PV output is well aligned with seasonal demand in California and the resource is also of much higher quality (almost double the German capacity factor). California wind is not very high quality though. In addition, California has access to cheap natural gas and hydro in order to balance out intermittent renewables whereas Germany is increasingly forced to do this with hard coal. Balancing with coal is much more expensive than balancing with natural gas and hydro. About the energy imbalance market, the expansion of the balancing area will increase the value of intermittent renewables by lowering the effective penetration of these intermittent sources over the entire balancing area (up to the point where additional transmission costs and complexity start to outweigh these benefits). Initially, such a market mechanism will therefore result in a lower overall system LCOE. However, as you said, this will socialize some of the costs of intermittent renewables, asking people in areas with low/negligible penetration of intermittent renewables to shoulder a substantial part of this cost burden. In summary (from my understanding), an EIM will create an effective wealth transfer from people in areas of low renewables penetration to people in areas of high renewables penetration. When looking at the overall system, however, the total system LCOE should come down (up to the point where transmission costs and system complexity start to exceed benefits), meaning that the people in areas of high penetration gain more than the people in areas of low penetration lose. The magnitude of these costs should also be substantially smaller than in Germany due to the factors outlined above, thereby making technology-forcing of intermittent renewables politically feasible up to a higher level of penetration. I read this activity like this. I prefer to assume (for gross simplicity) that all wholesale prices are equal or almost equal. Thus when a glut of electricity becomes available exceeding the amount demanded by the market, the wholesale price drops. Renewables are able to cope with this as their FiT is levied after the wholesale price have been agreed/paid/used. Thus despite a renewable operation having a negative wholesale price, it gets a positive retail price due to the FiT rebound. Why I say wholesale prices are the same for all is for simplification as it shows that the wholesale prices for all generators is negative and those that do not get compensated additional to what the market will pay for this cannot generate a positive retail value. Thus it is not an advantage to have a negative wholesale price. Even so much of this electricity is discounted as it is not priority dispatch and the more expensive FiT corrected product is used. This goes some way to explaining qualitatively why some gas plants have negative operations. Thanks for the links. To be honest, I actually thought California had more intermittent renewables (probably due to the massive amount of solar-hype). 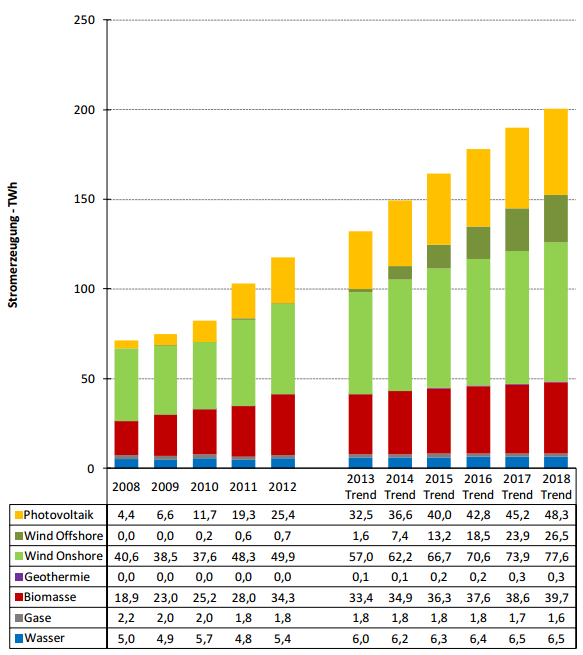 According to these links, the actual solar and wind generation in 2012 was only 0.9% and 4.6% respectively. California is therefore still a long way from having to face the kind of issues that Germany is currently dealing with. Regarding the duck graph, I think the energy imbalance market will play an important part here. As shown in the article above, Germany uses a large amount of trade with its neighbors to achieve the rapid ramping required by solar PV both in the mornings and the evenings. California will have to do the same in order to make this work in a reasonably economical manner. Yes, we are indeed in for some interesting times. The integration of intermittent renewables will bring many unexpected challenges which will be discovered courtesy of German and Californian ratepayers. It will be very interesting to observe these experiments over coming years. Do customers matter? 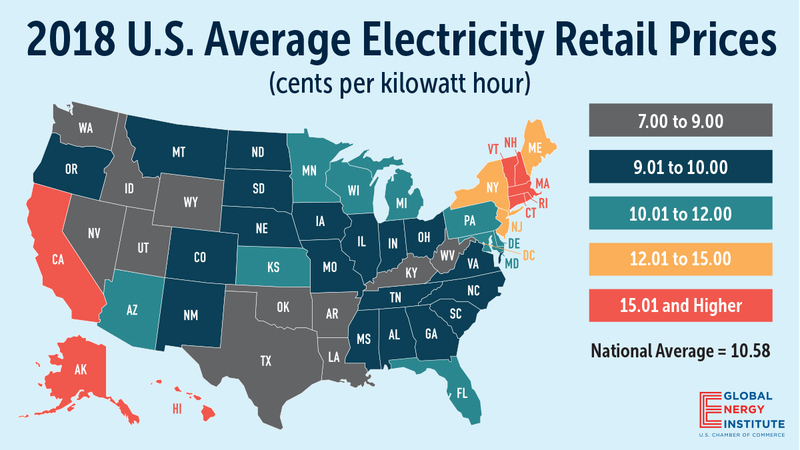 Yes, a silly question .... until one looks at the major conclusion of this latest comparison of state electricity prices, i.e., " a growing backlog of needed natural gas delivery infrastructure is more than offsetting the..